Have your own site? Offer free content to your visitors with TRIGGER$ Public Edition! Sell TRIGGER$ from your site and grow a monthly recurring income! Contact goldenphi@triggers.ca for more information - (free ad space for participating affiliates). 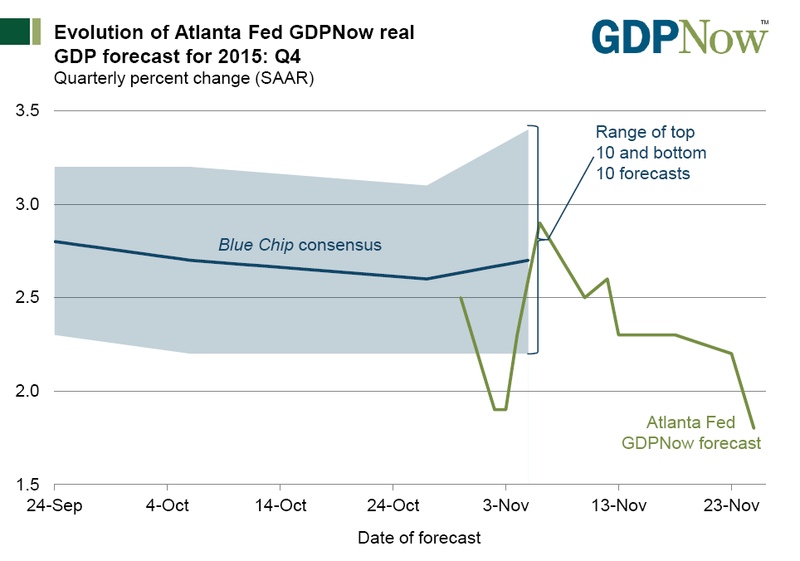 Following today's personal income report in which consumer spending rose only 0.1% month-over-month, the Atlanta Fed GDPNow Forecast for fourth quarter declined by 0.5 percent to 1.8 percent. 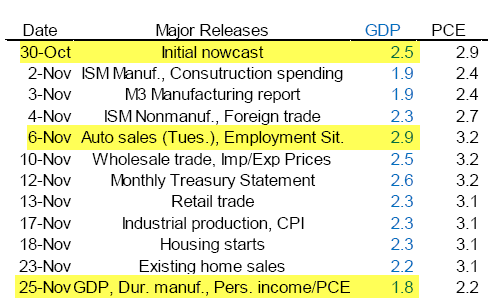 "The GDPNow model forecast for real GDP growth (seasonally adjusted annual rate) in the fourth quarter of 2015 is 1.8 percent on November 25, down from 2.3 percent on November 18. The forecast for the fourth-quarter rate of real consumer spending declined from 3.1 percent to 2.2 percent after this morning's personal income and outlays release from the U.S. Bureau of Economic Analysis." The latest Blue-Chip forecast for early November was 2.7%, a highly unlikely number at this stage unless season spending picks up big time. Reports show stores are not discounting merchandise as much as consumers like, and consumers generally expect to spend less, so odds of a hefty jump in Christmas sales is questionable. We may know more next week when reports on Black and Blue Friday become available. 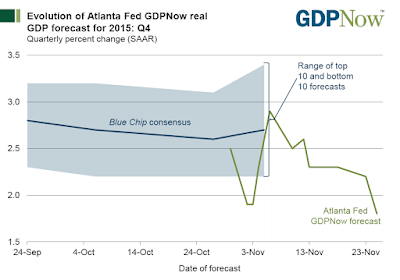 The initial 4th quarter GDPNow forecast started at 2.5% on October 30. It rose as high as 2.9% following the auto sales and jobs reports. It's pretty much been downhill since then. Wholesale trade, retail trade, existing home sales, all knocked off points. Today's Personal Incomes and Outlays Report knocked off a half percentage point even though wage growth was substantial. Many signs point to consumer exhaustion. Christmas sales appear "tepid" at this point. Auto sales have been the one consistently bright spot, in this otherwise treading water economy, but what cannot go on forever, won't. Swiss Bank Hits Customers With Negative Interest Rates; Crazy? What About Velocity? Alternative Bank Schweiz (ABS), a small bank in Switzerland broke the negative interest rate on deposits barrier, CHARGING customers to cake their money. (emphasis in caps from the article). The Alternative Bank Schweiz wrote to customers telling them they would face a -0.125 per cent rate on their money from 2016 – and a -0.75 per cent rate on deposits above 100,000 Swiss francs. The move echoes the Swiss central bank’s -0.75 per cent negative deposit rate imposed on financial institutions placing money with it. Sweden’s central bank also introduced negative rates, which currently stand at -0.35 per cent, while the European Central Bank introduced them in part with its -0.2 per cent overnight deposit rate. The Bank of England’s chief economist Andy Haldane delivered a speech in September discussing how Britain could have to consider negative interest rates as an extreme measure in a future crisis. The big Swiss banks passed on some of the pain from the Swiss central bank’s -0.75 per cent rate to their institutional clients, but Alternative Bank Schweiz is believed to be the first retail bank to hit savers with a charge. The bank describes itself as an ethical organisation focused on backing firms investing in social and environmental projects. With its balance sheet totalling nearly 1.6 billion Swiss francs last year, most of its activities are concentrated in cooperative housing projects, providing affordable housing and sustainable energy solutions, as well as organic farming. Bloomberg offers a "quick take" on Less Than Zero. Imagine a bank that pays negative interest. Depositors are actually charged to keep their money in an account. Crazy as it sounds, several of Europe’s central banks have cut key interest rates below zero and kept them there for more than a year. For some, it’s a bid to reinvigorate an economy with other options exhausted. Others want to push foreigners to move their money somewhere else. Either way, it’s an unorthodox choice that has distorted financial markets and triggered warnings that the strategy could backfire. If negative interest rates work, however, they may mark the start of a new era for the world’s central banks. With the fallout limited so far, policy makers are more willing to accept sub-zero rates. Having once said that the European Central Bank had hit the “lower bound,” President Mario Draghi signaled in October and November that the deposit rate could be cut even further into negative territory. The ECB became the first major central bank to venture below zero in June 2014, and it now charges banks 0.2 percent to hold their cash overnight. Sweden also has negative rates, Denmark used them to protect its currency’s peg to the euro and Switzerland moved its deposit rate below zero for the first time since the 1970s. That means investors holding to maturity won’t get all their money back. Banks have been reluctant to pass on negative rates for fear of losing customers, though Julius Baer began to charge large depositors. 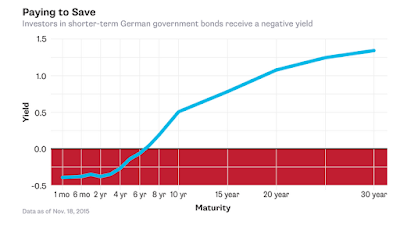 Negative interest rates are a sign of desperation, a signal that traditional policy options have proved ineffective and new limits need to be explored. They punish banks that hoard cash instead of extending loans to businesses or to weaker lenders. Rates below zero have never been used before in an economy as large as the euro area. While it’s still too early to tell if they will work, Draghi pledged during the height of Europe’s debt crisis in 2012 to do “whatever it takes” to save the area’s common currency, signaling the ECB’s willingness to be innovative. It chose to experiment with negative rates before turning to a bond-buying program like those used in the U.S. and Japan. In theory, interest rates below zero should reduce borrowing costs for companies and households, driving demand for loans. In practice, there’s a risk that the policy might do more harm than good. If banks make more customers pay to hold their money, cash may go under the mattress instead. Janet Yellen, the U.S. Federal Reserve chair, said at her confirmation hearing in November 2013 that even a deposit rate that’s positive but close to zero could disrupt the money markets that help fund financial institutions. Two years later, she said that a change in economic circumstances could put negative rates “on the table” in the U.S., and Bank of England Governor Mark Carney said he could now cut the benchmark rate below the current 0.5 percent if necessary. That's actually a balanced synopsis by Bloomberg as far as it went. But unlike Europe, the US has large money market funds that would be destroyed by negative rates. Banks may be able to hold out for a while by raising other fees, but money market funds would immediately be in trouble. Customers would withdraw money, put it into banks charging the lowest fees, stuff cash under the mattress, or open safe deposit boxes. If rates get negative enough, there would be a run on the banks, but arun on money market funds would likely happen first. The central bank thesis is to get people to spend the money. But note the absurdity. Someone must hold every dollar printed at all times. If you buy a candy bar and eat it, or a coat and wear it, the store that sold those items to you has has the money. Mathematically, someone at all times must hold all the money. Reader "Vince" has been bugging me to write about the velocity of money. Velocity purportedly measures the speed at which money circulates in the economy. I have commented before on the absurdity of the velocity thesis, but this seems like a good time for a rehash. The value of transactions = price * transactions = GDP. Thus, velocity is nothing more than GDP divided by money supply. Here is the equations, two ways. Right now, velocity is falling simply because money supply is increasing faster than GDP. But what constitutes money supply? M1, M2, MZM, base money, and true money supply all yield different measures of velocity. So is velocity 1.7, 5.9, 1.5, 1.3 or something else? If we rearrange the equation, GDP / Velocity = M.
Supposedly we know GDP but what do we plug into the equation for velocity to derive M? Can one independently measure velocity? The answer to that question is a resounding no. Since GDP = PT, GDP can rise if prices rise and GDP can go up if transactions go up. GDP can rise if transactions decline, provided prices rise enough. And GDP can rise if prices decline, provided transactions rise enough. Velocity has no life of its own. Velocity does not cause anything to happen. Velocity cannot be measured by any independent means. Curiously, economists are concerned about "falling velocity" as if it means something other than the central banks are printing money that sits as excess reserves. Inquiring minds may also be interested in the Frank Shostak's 2002 article Is Velocity Like Magic? Much of my understanding of velocity comes from that article. On November 20, Draghi Pledged to ‘Do What We Must’ to Boost Sluggish Inflation. Mario Draghi has dropped his clearest hint yet that the European Central Bank is about to inject more monetary stimulus into the eurozone economy, brushing aside staunch opposition from Germany’s powerful Bundesbank. The ECB president said yesterday that ECB policymakers would “do what we must to raise inflation as quickly as possible”. The remark echoed a promise Mr Draghi made during the region’s debt crisis in 2012 to do “whatever it takes” to save the single currency. The ECB is widely expected to unleash a souped-up version of its €1.1tn quantitative easing package and consider cutting one of its benchmark rates deeper into negative territory. I laughed out loud at that last line. If QE increases velocity, then why is velocity declining in the US, in Europe, and in Japan? By the way, bank reserves do not circulate. Reserves are deposits that are not lent out. One can even argue that money does not really circulate per se, as it has to be held at all times by someone. Let's return to this statement by Bloomberg: "Crazy as it sounds, several of Europe’s central banks have cut key interest rates below zero and kept them there for more than a year". 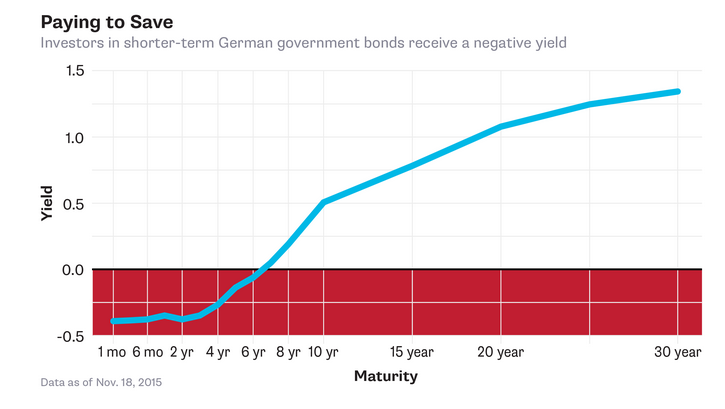 Negative interest rates are a sign of central bank desperation. They are a sign central banks are clueless about how the economy really works. And they are a sign of extreme hubris coupled with extreme stubbornness as Japan has proven over the course of three decades that unconventional measures do not work as economists expect. It's crazy to keep trying things that cannot possibly work, over and over again. Third-quarter U.S. earnings look set to be the worst since 2009 and the trend remains negative through year-end. Profit fell 3.3 percent on a share-weighted basis in the latest quarter, based on data from about 96 percent of S&P 500 companies already reporting. This marks a second consecutive quarter of negative earnings growth. The energy sector saw the biggest damage, hurt by plummeting oil prices, with earnings dropping 57 percent in the third quarter, year on year. Dollar strength is also hurting U.S. profits and revenues, according to Societe Generale. “The question for us is not are we in a U.S. profit recession, but how bad is it likely to get and what are the implications for the wider U.S. economy, and with that massive consensus long on the U.S. dollar,” SocGen quantitative analysts led by Andrew Lapthorne wrote in a Nov. 19 note. "We continue to be very concerned about U.S. profits. For over a year now excuse after excuse has been rolled out as to why U.S. profits are not actually as weak as the headline numbers imply, but the reality is the U.S. profits and revenues are declining and the strong U.S. dollar is a large part of the problem," they wrote. The negative trend is set to continue into the fourth quarter, with analysts expecting a 5 percent year-on-year decline in S&P 500 profits, according to data compiled by Bloomberg. In dollar terms, profits from S&P 500 companies have fallen by about $25 billion in the first three quarters of the year compared with the same period in 2014, while revenues have dropped by $287 billion. i) bifurcated thematic returns. Goldman thinks that due to divergent monetary policies (Fed tightening vs. ECB and BoJ easing) the USD will strengthen and benefit some stocks and harm others. Some of those impacted the most will be multi-nationals and luxury retail companies (see Tiffany earnings today). Overall, the biggest headwind cited by companies in Q3 has been the strong dollar - expect this to continue and to further depress revenues, and thus earnings. ii) higher rates. According to Goldman, "when fund managers eventually realize the tightening process will be more sustained than originally anticipated the P/E multiple will contract and offset the otherwise positive impact of 10% earnings growth." iii) margin expansion stories. If companies can't rely on top line growth, and multiple expansion is not available, there is just one source of growth: margin expansion. It is bullet iii) that is the most important, because here the divergence between Wall Street's hopium-driven margin euphoria is most visible. According to Goldman, "tech accounted for 50% of the overall S&P 500 expansion during the past five years (Apple is responsible for 20% of rise). Tech sector now has margins (18%) that are twice the overall market." That tremendous tech, but mostly AAPL-driven, margin growth has now ended. So can this torrid surge in tech margins continue? Goldman's answer is a resounding no. S&P 500 net margins have been essentially flat for five years at just below 9%. We forecast margins will remain flat in 2016 and 2017 at 9.1%. Information Technology has been a notable exception with margins rising in recent years to 18%, or 2x the overall market. However, roughly 40% of the 847 bp leap in Tech margins since 2009 is attributable to Apple (AAPL) alone. Given rising labor and health care costs, firms in most industries will struggle to simply maintain margins. Investors will reward firms able to demonstrate a path to higher sales and margins. In other words, if the Fed is hiking "because it sees something about the economy" that few others do - i.e., rising wages - then by definition that means that profit margins will contract as growing wages take out ever bigger chunks of the corporate bottom line. So with sales declines set posied to accelerate due to the soaring dollar, central bank liquidity-driven multiple expansion no longer feasible and corporate margin growth set to resume its contractionary path again, we wonder where will the next leg higher in stocks come from. Unless, of course, the whole "the Fed is hiking because theS&P500 has topped out economy is recovering" was just the latest economist consensus mirage. The infographic above shows some differences in Keynesian and Austrian views. Courtesy of The Austrian Insider. FRA Interview of Robert Wenzel by FRA Co-founder Gordon T Long. Across well-known literature, the Austrian school of economics has earned and put its indelible mark on the complicated world of economic analysis and theory. The school of thought varies significantly from the mainstream schools of economics like the classical, neoclassical and Keynesian schools of thought. In essence the Austrian school of thought believes in using logical thoughts to explain and solve economic problems rather than getting technical and going into mathematics to explain the same problems. Unlike the mainstream none-Austrian economists, Wenzel believes that there’s a lot to be understood from the economy based on logical build up from solid premises. He goes on to mention that another key aspect to be understood is that Austrian economists believe that when the Fed injects money into certain sectors of the economy, it’s those sectors that turn to boom. According to Wenzel, when the Feds eventually start tightening this money supply it leads to a crash. Wenzel thinks there could be an increase in price inflation and the possibility of another dip in the price of oil. Explaining how we have inflation in some areas and deflation in others when we’ve been pumping money into the system, he explains it by outlining how it depends on how quickly people want to spend the money. When people don’t spend money what happens is you have money building up in cash balances which Wenzel terms “the desire to hold cash balances”. With this you see people reluctant to spend money and hence a low velocity of money. On the confusing environment of economics and how understanding the Austrian school can help to clear things up .... Understanding the business cycle and inflation comes about in terms of the Austrian school of thought. It definitely helps to clear a lot of things up but even more can be taken from this approach. The methodology additionally helps out in terms of having people analyzing the world through logic rather than attacking it solely with empirical data. On considering Quantitative easing and going into negative nominal rates .... QE is a method where the fed prints a lot of money and buys long durtion debt. The negative nominal rates idea is based on the Keynesian idea that it’s spending that helps the economy to grow, so the idea is to use negative rates to pressure people to spend their money. Wenzel calls this “a tax on holding money”. It could happen at some point. The Fed’s target of 2% could easily go up to three 3% with accelerated printing of money. At this point they might raise rates but if the inflation is at 5% and they raise rates from 12bp to 2% that still won’t be able to fight the inflation. However it may be too soon to say hyperinflation. The business cycle should be understood as a boom and bust cycle. - - CORRUPTION & MALFEASANCE - MORAL DECAY - DESPERATION, SHORTAGES. "Transcendent liquidity" is a somewhat silly-sounding phrase coined by the equally silly Matt Hougan, CEO of ETF.com, to discuss the odd situation in fixed-income ETFs—specifically, fixed-income ETFs tracking narrow corners of the market like high-yield bonds. But it's increasingly the focus of regulators and skeptical investors like Carl Icahn. Simply put: Flagship funds like the iShares iBoxx High Yield Corporate Bond ETF trade like water, while their underlying holdings don't. Is this a real problem, or a unicorn? The problem with even analyzing this question starts with definitions. When most people talk about ETF liquidity, they're actually conflating two different things: tradability and fairness. On a value basis, the average spread for HYG on a bad day of the past year is under 2 basis points. It's consistently a penny wide on a handle around $80, with nearly $1 billion changing hands on most days. That puts it among the most liquid securities in the world. And that easy liquidity is precisely what has the SEC—and some investors—concerned. But that's tradability, not fairness. Fairness is a unique concept to ETF trading. We don't talk about whether the execution you got in Apple was "fair." You might get a poor execution, or you might sell on a dip, but there's no question that your properly settled trade in Apple is "fair." That's because Apple stock is always worth precisely what you pay for it. That's the entire function of the market—to determine the fair price for Apple based on the collective wisdom of buyers and sellers. Of course, even Apple can get a bad print, and there are rules for breaking really erroneous trades, but for the most part, if Apple's down 10%, nobody considers it anything other than a bad day for Apple. In an ETF, however, there is an inherent "fair" price—the net asset value of the ETF at the time you trade it—intraday NAV or iNAV. If the ETF only holds Apple and Microsoft, that fair price is easy to calculate, and is in fact disseminated every 15 seconds by the exchange. But when the underlying securities are illiquid for some reason (hard to value, time-zone disconnects or just obscure), assessing the "fair" price becomes difficult, if not impossible. If the securities in the ETF are all listed in Tokyo, then your execution at noon in New York will necessarily not be exactly the NAV of the ETF, because none of those holdings is currently trading. In the case of something like corporate bonds, the issue isn't one of time zone, it's one of market structure. Corporate bonds are an over-the-counter, dealer-based market. That means the iNAV of a fund like HYG is based not on the last trade for each bond it holds (which could literally be days old), but on a pricing services estimate of how much each bond is worth. That leads to the appearance of premiums or discounts that swing to +/- 1%. Compare that with the handful of basis points typical in the SPDR S&P 500 ETF. Importantly, this is over the last year, which has been a pretty calm market for HYG. During crisis periods, HYG can spike a premium or discount of more than 10%. The reason is pretty simple: profit motive. ETFs only trade in line with their underlying securities because authorized participants (APs) can make or dispose of new shares through the creation and redemption process. If there is a premium, they can sell at that premium and make new shares by delivering the underlying. They can do the opposite if the ETF is at a discount: buying the cheap ETF shares and returning them to the issuer for a basket of underlying securities. In each case, they're buying low and selling high. But if the underlying market can't actually handle the volume implied in making or redeeming shares, the APs will let the price drift until the gap is so wide they're positive they can make money. And because there are multiple APs all trying to book a profit, when the gap widens and stays wide, it points to costs and risks that may not be obvious just looking at the numbers. You can see in the fall of 2011, everyone wanted out, and the fund traded to a 2% discount. Then everyone wanted back in for months, and it consistently traded at premiums as high as 2.5%. Then in mid-2012, again, people wanted out, and boom, right back to a 1.5% discount. It's critical to note that all of these premiums and discounts happened while HYG continued to trade a penny wide. So there was enormous liquidity—it was just centered around a price that was "too high" or "too low." This connect can have two explanations: Either the ETF is in fact "right" and is serving as the price discovery vehicle, or the NAV is "right" and the ETF is overpriced. It's not possible to prove without question which is going on, but I tend to side with the market. If billions of dollars are going to change hands at a price that's "too high," I think the billions of dollars are the market, and this is price discovery on an illiquid market. In fact, if you look at the largest corporate bond ETFs, the picture doesn't get much better when you go into the investment-grade or short-duration space. The most liquid ETF, the iShares iBoxx $ Investment Grade Corporate Bond ETF, has underlying bonds that on average only trade $4.7 million per day, and short term bonds, represented by the Vanguard Short-Term Corporate Bond ETF, fare worst of all. By comparison, the ETF on the equity side you'd expect to be truly illiquid—the iShares Russell 2000 ETF—has underlying holdings that are an order of magnitude more traded on a daily basis than the most liquid bonds issued by the largest companies in the world. Larger funds with big positions will obviously be more impacted than small funds, so when you combine the huge size of a fund like VCSH with the relative illiquidity of its holdings, it's hard to see how they pass the test. Nobody would suggest that a fund would ever literally just try and dump an entire day's worth of volume into the market, day after day, and not impact prices. Instead, a trade impact model would map out a much longer time window to unwind a position. So the true time to unwind the average VCSH position might actually be more like 40 or 60 days (and on top of that, VCSH is just a share class of a larger mutual fund). Does that mean every corporate bond fund closes? Probably not - I expect the SEC to revise their proposal several times before anything becomes the law of the land. However, it will likely highlight the real problem here—the broken nature of the bond market (and possibly make it worse, if significant assets must be liquidated to comply with the rules). Already only about one-third of corporate bonds actually trade more than once every few months, and just 11% of the listed corporate ponds represent almost 60% of the actual dollars trading in corporate bonds, according to Tabb group. The dealer market has collapsed, and all that's left are investors trading the same few bonds back and forth, leaving pricing services guessing with bigger and bigger margins of error on the real value of illiquid debt. That's the real problem. And it's not one the SEC can fix by targeting "transcendent liquidity" in ETFs. Following up on last week’s piece highlighting the catastrophe of negative interest rates created by Central Bank Policy, I found myself thinking, as I’m sure you did too, a lot about the catastrophe in Paris. Outside of the dark vs. light human battle (of which I believe light will win), I gave thought to the potential unwinding of the great European Union experiment and what it might mean for our collective financial health. Coincidentally, a great geopolitical strategist piece crossed my desk this week. I share it with you below. Maybe I’m obsessing over what I feel is transitory faith placed in global central bankers (the Fed, ECB, JCB) but I can’t help recalling Bernanke’s “Goldilocks” quote on February 14, 2007 (New York Times) and the happy no-doc mortgage days in 2007/08. The economy was not too hot, not too cold but just right. Right? I felt a bit like Chicken Little in my writings back then. The “sky is falling” and all that sort of thing. Was the sky falling or was opportunity being created. It depends on your portfolio positioning at that time. It turned out to be a great opportunity if one was prepared. Wait and see what happens if Italy, Spain or Portugal pulls a Greek-like default move. Contagion being the “critical phenomenon”. I feel a little bit like Chicken Little again today. In the book House of Cards, William Cohan exposed the corporate arrogance, power struggles and deadly combination of greed and inattention which led to the collapse of not only Bear Stearns and Lehman Brothers, but the very foundation of Wall Street. Despite Fed Chairs Greenspan and Bernanke’s inability to (admittedly) see the risks, there was abundant evidence that I and others wrote frequently about prior to the crisis. Though truthfully, in my wildest dreams, I didn’t imagine the entire financial system would come so near to collapse. “Sort of intellectually shocked”? Gotta love his honesty. One of the pieces I penned in late 2008 was titled “So Bad It’s Good”. It just didn’t feel good, emotionally, at the time. But with fear in heart and conviction in process, I took action and while I was a bit early, it turned out to be an exceptionally good trade. Then, yields on high yield bonds were close to 20%. That’s what I believe may present again in the not too distant future. Until then, it’s a process of participation, protection and patience. At a recent conference, I was asked what I see as the biggest risks ahead. I answered that it is not subprime but everything that existed in 2008 from the perspective of debt levels, debt to GDP, margin balances and derivative exposure (and the related counter-party risks) is worse today than in 2008. Further, the Fed now finds itself painted into a corner with an inflated balanced sheet (QE asset purchases) and a zero interest rate policy. So, I spoke of three big risks on the near horizon that may impact the equity and high yield markets and added that I feel like I did when I wrote about crazy high valuations in 1998 (“It’s not different this time” though I was two years too early) and in 2007 and 2008 (writing about subprime and leveraged derivative products). I believe a sovereign debt crisis will be tied to loss of confidence in government (and central bankers). That appears to be in motion. The debt to GDP ratios of the sovereign debt issuing countries are, in a word, unmanageable. Too much debt slows growth. Governments, absent the hoped for growth, raise taxes to cover increasing payables. Expect further slowing. We are in a debt deflationary cycle and the evidence, at least to me, is clear a global recession is probable if not already under way (see updated global recession watch chart below). Enter Draghi stage right. For now, it is kick the can. In the end, I believe some form of default/reorg of debt will be required. With negative interest rates in Europe and the ECB talking more QE, while at the same time the U.S. exiting QE and looking to raise rates, it is advantage dollar. The balance of the developed world is in the same high debt induced low growth deflationary mess. They are all working off the same play book – devalue their currencies. Such would make their goods more attractive to foreign consumers. Advantage U.S. dollar. However, it is the strong dollar that may trigger risk number two. Non-U.S. borrowers took out loans from dollar based lenders, then a low interest rate loan with belief that U.S. QE would further devalue the dollar. Borrow low and use their appreciated currency gains to reduce the amount of money in real terms needed to pay back. A win win. However, just several years later, who would have imagined negative interest rates in Europe vs. higher interest rates in the U.S. More QE there vs. exit of QE here. A rising dollar means that $9.6 trillion in such loans may have to pay back $12 trillion (if the dollar rises another 20%) due to their bad dollar bet. Oops. In comparison to subprime (call it $2 trillion at face value), this EM dollar denominated debt issue is no small issue. The next chart is a look at subprime origination pre-crisis. Roughly $1.8 trillion was originated between 2004-2007. The point I am trying to make is that $9.6 trillion is real money certainly relative to the size of the subprime crisis that tripped the blow-up wire in 2008. Big problem – number two is tied to EM dollar denominated debt. It is going to get trickier if the dollar continues upward. The Fed is painted into a corner. The third risk is tied to the $1 trillion in high yield debt issued in the last five years. The size of the high yield market is now $2 trillion. It took from the late 1970s and the early days of Michael Milken and Drexel Burnham to 2010 to grow to $1 trillion and just five years later it stands at $2 trillion. Many companies received money that extended their life line. Investors chased into higher risk assets making that easy money available. Recession is probable in 2016 or 2017. Nearly $750 billion is set to mature over the next several years. Finding additional borrow will be difficult in recession. The lesser will default. Default rates will spike. Prices will decline. Yields will go higher. Recession happen once or sometimes twice every decade. Watch the timing of recession and be prepared to take advantage the opportunity that will be created. What happens when the good times end? The 2008 crisis had severe, long-lasting consequences for the U.S. and European economies. Roughly 6% of the workforce. The U.S. stock market fell approximately 50% by early 2009. By early 2013, the U.S. stock market had recovered to its pre-crisis peak but housing prices remained near their low point and unemployment remained elevated. Economic growth has remained well below par. We are in a 2% growth world and not the 3.5% governments are hoping for. Europe continues to struggle with elevated unemployment and severe banking impairments estimated at €940 billion between 2008 and 2012. With a heavy hand to the banks, it was hey boys, we want you to buy all the AAA rated Greek, Italian, Spanish, French bonds you can buy. Now, the ECB (QE) is trying to bail out the banks. Those banks are in trouble. Too much debt. The problem is far from over. The big bubble today is in the bond market. Sovereign, EM and HY defaults. Keep a close eye on the recession probability models I share frequently in Trade Signals. I think the jig is up when confidence in government is lost. Melt up? It could happen though I don’t have high conviction. Thus, I sit in the own equities but “hedged” camp. Valuations are just not attractive so I favor 30% instead of 60% but note that this is just a conceptual thought and not a recommendation as I don’t know your risk level nor risk tolerance. And add a handful of liquid alternative return streams to your portfolio for enhanced diversification. As a quick aside, if you haven’t had a chance to watch “How The Economic Machine Works” by Ray Dalio – click here. It’s awesome. Have your kids watch it too. I mentioned that the timing of a sovereign debt crisis in Europe, in my belief, is tied to a loss of confidence in government. So let’s go there next. The following excerpt is from the great geopolitical strategist, George Friedman. When I read the piece, I kept thinking about fractures and lost confidence in government. It is on my radar for reasons introduced above. I believe you’ll find Friedman to be a deep thinker. The wave of immigration that has swept into Europe from the Islamic world in general, but particularly the more recent stream of refugees from Syria, has created a political crisis in Europe and one that was particularly raucous prior to October 1. Charges were being levelled by Germany against Central European countries for refusing to accept refugees. In turn, those countries charged that Germany was demanding that small countries transform their national character with the overwhelming numbers of refugees housed there. In addition, these countries, particularly Hungary, argued that among the genuine refugees there would be members of terrorist groups and that it was impossible to screen them out. Had Europe been functioning as an integrated entity, a European security force would have been dispatched to Greece at the beginning of the migration, to impose whatever policy on which the EU had decided. Instead, there was no European policy, nor was there any force to support the Greeks, who clearly lacked the resources to handle the situation themselves. Instead, the major countries first condemned the Greeks for their failure, then the Macedonians as the crisis went north, then the Hungarians for building a fence, but not the Austrians who announced they would build a fence after the migrants left Hungary. Between the financial crisis and the refugee crisis, Europe had become increasingly fragmented. Decisions were being made by nation-sates themselves, with no one being in a position to speak for Europe, let alone decide for it. I have long made the claim that the transnational nature of Europe cannot be sustained. The divergent economic interests of EU countries, some with unemployment over 20 percent, some with it under 5 percent, meant that it was impossible for all of them to live not only under the same monetary regime, but under the same trade regime, which we cannot call free trade with agriculture, among other things, being protected. This would lead to a focus on national interest and on a resurrected nation-state. This was the fundamental problem of Europe and the migration crisis simply irritated the situation further, with some nation-states insisting that it was up to them to make decisions on refugees in their own interest. The response of Europe to the Paris attacks brought together all of these matters, and Europe only responded when some nations decided to use their national borders as walls to protect them from terrorists. It is important to notice that this was not the EU creating checkpoints independent of national borders to trap terrorists or block them. The EU wasn’t built for that. Rather, it was the individual nation-states, reasserting their own rights and obligations to secure their own borders that acted. Despite all the rhetoric of a united Europe, the ultimate right of national sovereignty and the right of national self-defense was never removed. Once it has been established that this implicit right can be used and the basic boundaries inside of Europe are the old European borders, we have entered a new Europe, or rather the old one. It is not clear when or if the border checkpoints will come down. After all, the war with the jihadists has created a permanent threat. Since there is no one to negotiate with, and no final blow that will end the war, when should the borders be opened again? What IS created, without intending it, is the fragmentation of Europe, with each state protecting itself. When will Europe decide it no longer needs checkpoints at the borders? When is it safe? And, if it is not safe, how do the borders come down? You cannot control the movement of people without controlling the movement of goods. Whatever the rules at the moment, the nation-state has reasserted its right to determine what vehicles enter. Once that principle is in place, the foundation of Maastricht does not disappear. The agreement is still there, but the claim to ultimate authority is not in Brussels or Strasbourg, but in Madrid and Budapest and Berlin. This causes more than delays at the border, it essentially creates a new mindset. This started as a counter to Russian and French airstrikes. It has culminated in unintended and unanticipated consequences, as is the norm. An airstrike in Syria, attacks in Paris, and the borders are back. Only to stop terrorists, of course. But that “of course” is dripping with historical irony. The following model looks at a composite of leading indicators for 35 countries. Indicators such as money supply, yield curve, building permits, consumer and business sentiment, share prices and manufacturing production. It then uses a logistic regression method incorporating the composite of leading indicators and trend data for all 35 countries. The objective is to predict the likelihood of a global recession. A score above 70 indicates a high recession risk and below 30 signals low recession risk. The box at the bottom center of the chart shows the “Model vs. Actual Recession.” Note that global recession has occurred 85.42% of the time when the model reading has been above 70%. It is at 86.1% today. I find it hard to bet against the current odds of a global recession. I believe we are in one now. The U.S. is in better shape. Though let’s keep a close eye on the next two charts. Keep an eye out for down arrows in the top section of the above two charts. Send me a note if you find the charts confusing. I’ll be happy to walk you through them. Invest in a few liquid alternative mutual funds. Look for proven managers and find complementary pairs meaning strategies that may deliver return but do so in a way that don’t correlate with each other. Match their historical return streams together and see if the correlation is close to zero. Consider current high valuation levels in U.S. equities. If you agree they are high (with forward probable 10-year returns low much like 2000 and 2008), then reduce exposure and hedge. Find equity mutual funds that do it within a strategy or do it yourself. Let me know if you would like some targeted ideas. The point is that there are many good funds and ETF’s to consider. 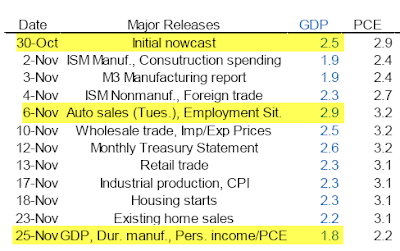 The significant signal this week is the -2 reading on the Don’t Fight the Tape or the Fed model. The model looks at the technical health of the broad equity market (how are most stocks doing across the various sectors). When the majority begin to break down and just a few support the market (looking at trend and momentum of thousands of stocks), the technical health is not good. This indicator combined with a 10-year Treasury yield indicator creates a reading from +2 (bullish) to -2 (bearish). The last model reading of -2 was in 2012. As you’ll see below, the annual gain per annum when the reading was -2 was a -46.8% (an occurrence 5.9% of the time since 1998). Note that doesn’t mean a 46.8% decline is coming; it just means that the market has declined during past periods of -2. Thus the “watch out for -2” warning. Also interesting is the relatively high level of investor optimism. This is surprising after last week’s negative week for U.S. equities. This combined with a negative reading in the CMG NDR Large Cap Momentum Index and a collection of other unfavorable technical readings (below), suggests, to me at least, reduce and hedge equity exposure. The market remains richly priced. Risk is high. Click here for the link to the charts.